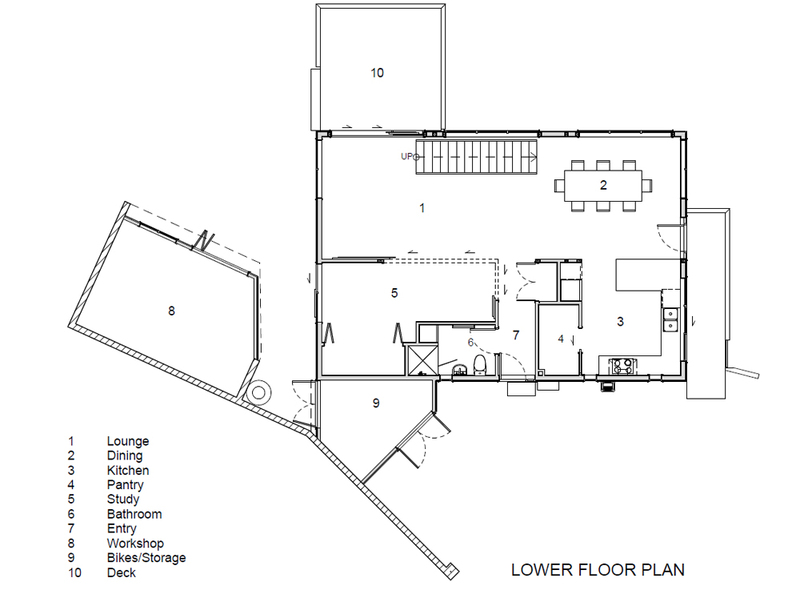 An energy efficient two-storey family home with a carport and separate workshop. 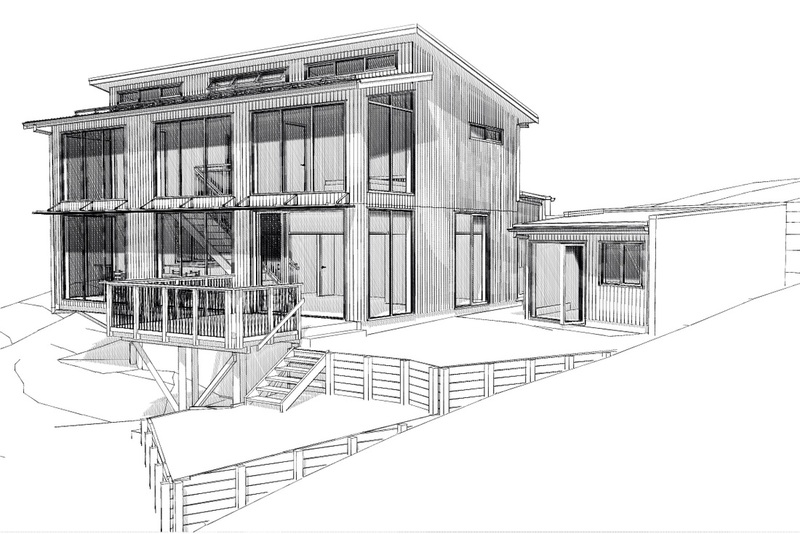 Construction is timber framing (with exception of some masonry walls) with vertical shiplap wall cladding on a cavity, and trapezoidal Colorsteel roofing. 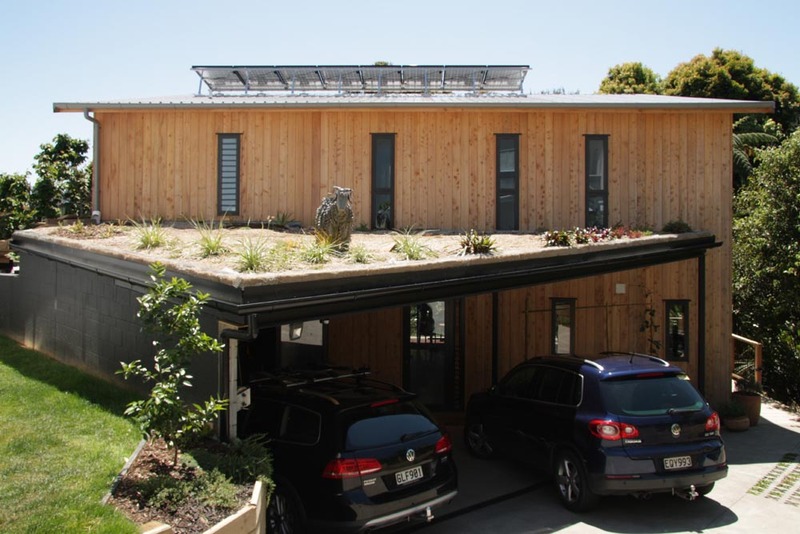 Green roofs on the carport and workshop reduce impermeable surfaces. 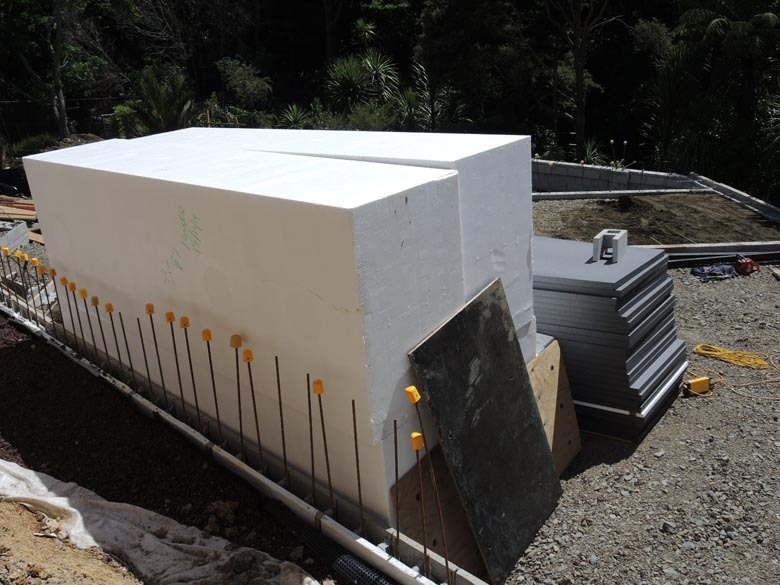 All living spaces have 140mm deep exterior wall framing to allow for R3.8 polyester insulation. Although nestled into a bush clad gully, the house still catches ample sun for passive solar heating through large north facing windows. Passive solar design and ventilation reduce energy consumption, and solar PV panels provide much of the electricity requirements. The house incorporates recycled content from the demolished ex-state house that used to occupy the site. 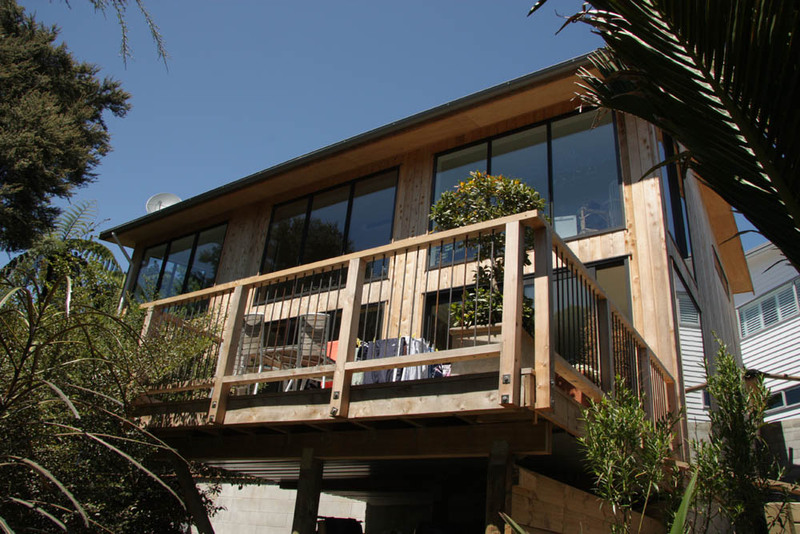 The owner has skilfully fabricated the stair treads from recycled rimu framing and salvaged floor boards were also re-used for the upper level flooring. Although Bedroom 2 has no exterior walls, it gets ample daylight from glazing to the landing, and ventilation via louvres that open to the clerestory windows above the landing. A set of louvres can be seen at the lower left in the image below. 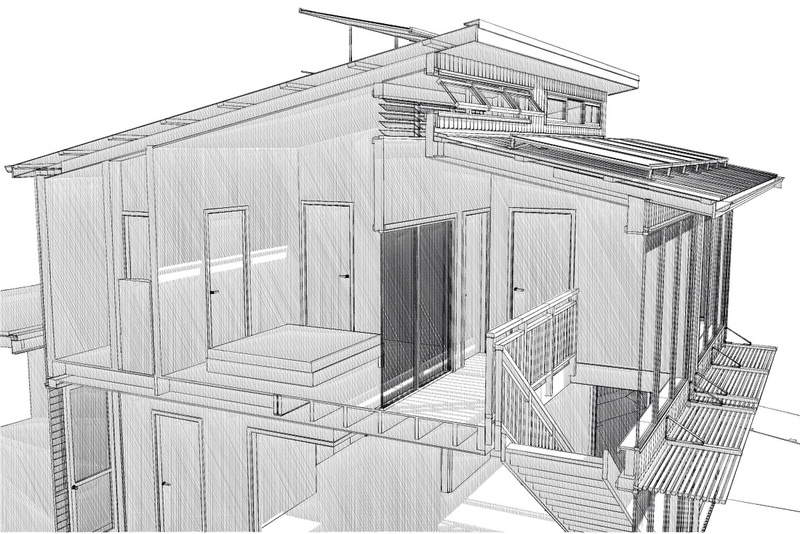 Through these, cool air is drawn in from the south facing carport as warm air rises and exits through the high level opening clerestory windows, an ideal configuration for passive ventilation. Due to the steepness of the site, a large amount of fill would have been required under the concrete slab. Instead of several truckloads of hardfill, the void was filled with Bondor Polyrock EPS polystyrene. 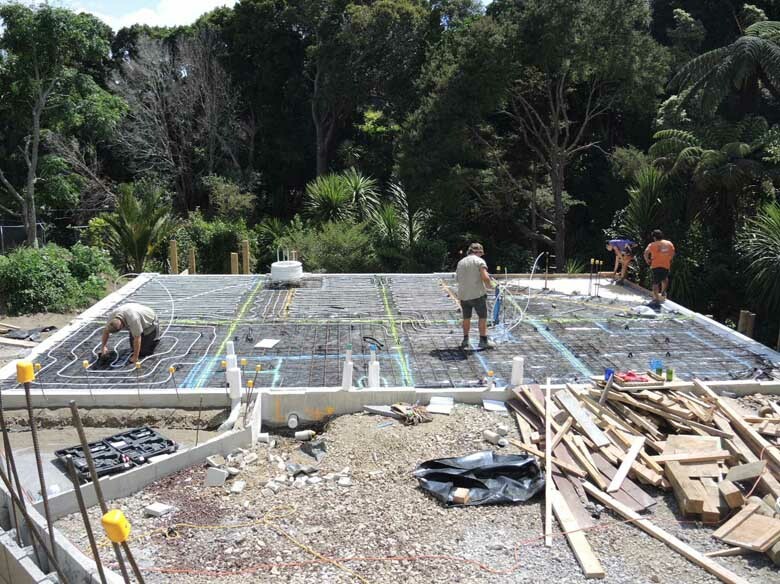 A hydronic underfloor heating system with an elaborate layout of controllable zones allows solar warmth collected on the northern side of the house to be transferred to whichever area the occupants wish to heat.